By Andi Jarvis Expect marketing and sport. By day, a Senior Account Manager@TheTomorrowLab, by night a sports blogger @EximoSports. The Tomorrow Lab Presents (#TTLPresents for short) is a series of digital marketing events held in Belfast. The event is focused on bringing some of the biggest and best speakers from the industry to Belfast to help grow the profile of digital marketing and increase the skills of digital marketers in the area. Down the road in Dublin, there are a number of excellent digital marketing events for people at all levels in the industry – from students through to experienced marketers and CEOs. In Belfast there is much less to choose from. The outstanding Digital DNA is the big ticket event that will soon be doing for the city what the Web Summit did for Dublin, but the regular events that fill up funky venues in D2 have never taken hold. Which is where #TTLPresents comes in. The event is hosted by The Tomorrow Lab, a digital agency in the city and has sharing best practice as a primary aim (and, for full disclosure, the people who pay me for my day job). #TTLPresents is coming to the end of its second year and focuses on one area of specialisation each event. Recent events have seen speakers from Unilever, LinkedIn, Bing and Google amongst others covering the evolution of digital advertising and social media for business. It wouldn’t be a digital marketing event if it wasn’t in an über cool venue and had pizza. The über cool venue is the Oh Yeah Music Centre. Nestled away in the heart of the Cathedral Quarter, it’s the spiritual heart of Belfast’s music scene, having helped everyone from The Undertones to Snow Patrol get started. The pizza is, well, pizza and comes pre-event, so make sure you get there early. 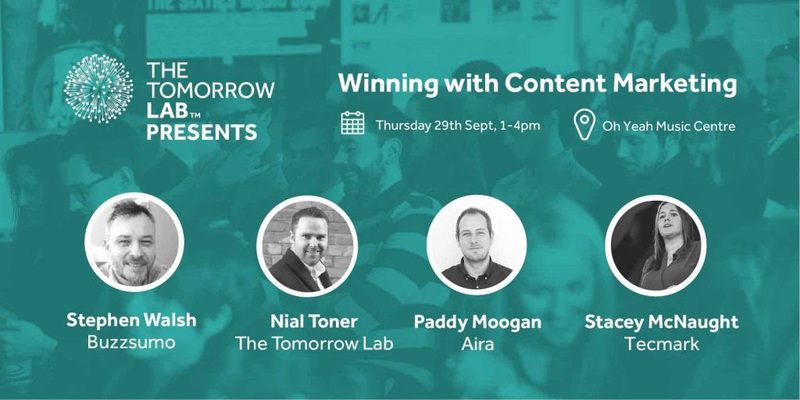 The next #TTLPresents, on Thursday 29 September, covers content marketing. There’s been a huge spike in interest about content marketing over the last few years as the Google Trends graph below shows, but how to do it well and stand out from the crowd is still the Holy Grail for marketers. Titled Winning with Content Marketing, #TTLPresents has a stellar line up of some of the best industry speakers on the subject. Buzzsumo is a tool many in the industry will be familiar with and Stephen Walsh from the company will be talking about B2B content marketing and using data to guide your strategy. Nial Toner heads the digital team at The Tomorrow Lab and is a passionate food and travel blogger with his wife at Pikalily.com. Nial will be looking at 10 great content marketing examples from a range of industries and highlighting what has made those campaigns so successful. Paddy Moogan, co-founder of Aira, is a regular speaker on the circuit and contributes to some of the digital marketing sites you probably already read – State of Digital, Moz and Search Engine Land. Paddy will take the audience through his biggest content marketing mistakes and show you how to avoid them. And finishing up the day will be the brilliant Stacey MacNaught from Tecmark. Stacey has been one of my favourite speakers in the industry for a few years now and she’s always insightful, funny, engaging and unmissable. Stacey will cover 21 tools and tactics to make life easier for content marketers. If you’re a content marketer or a company that is looking to expand its content marketing efforts, #TTLPresents is an unmissable event. As a special offer to readers of Irish Tech News, you can claim 25% off ticket price by using the code TTLPITN. The ticket purchase module is at the bottom of the event page on The Tomorrow Lab website. #TTLPresents takes place from 1pm to 4pm at the Oh Yeah Music Centre, Cathedral Quarter, Belfast on Thursday 29th September.